The 146.22 remote receiver antenna is the DB224 on the left. You can just see the MMRA network link antenna at the bottom. The fiberglass vertical in the center is for CCARC's UHF repeater. The D-Star antenna, another DB224, is located on the right. Here is a photo of the the Brookline repeater equipment rack. The radio on the very top is the HUB link radio. The radio below it is the UHF radio that links to the Prudential. On the right is the 146.22 receiver. Below the three radios is the SCOM 7K that controls it all. The Alinco power supply below the 7K supplies power for the remote receiver equipment. Next is the ICOM RP2C DStar controller, followed by the GE Mastr-II TX/RX. The GE Mastr-II was modified to operate D-Star. 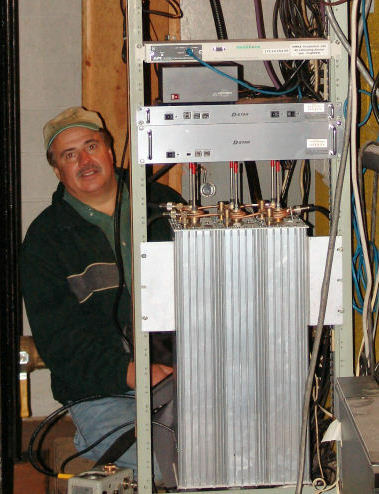 The D-Star repeater was originally installed at the MMRA's MRE location on September 15, 2008. It started out as an ID-RP2C control unit and an ID-RP2000V RF unit on loan to the club from Bob Stone, N1KMA. On September 26, 2009, it was moved to the Prudential tower. However, the RP2000V did not perform well in the high-RF environment of Boston. The DStar system in its original configuration. The box at the top of the rack is an APC remote power switch. The original Hustler G6-144B antenna. To improve the performance of the receiver, Harold, K3FG reconfigured a GE MastrII repeater for Dstar. The system was put back in operation on November 25, 2011. At the same time, a new Dstar Gateway, built and configured by Tom, W1NGS, was put into service. This configuration also featured an analog mode - notice the SCOM 5K at the top of the rack. This was a true hybrid analog/D-Star system - whichever type of signal was active on the receiver input, the repeater would switch to that mode on the output. The newer configuration with the Mastr II. We have also switched to a Diamond X30A antenna. The new configuration also had problems with the high-RF environment. 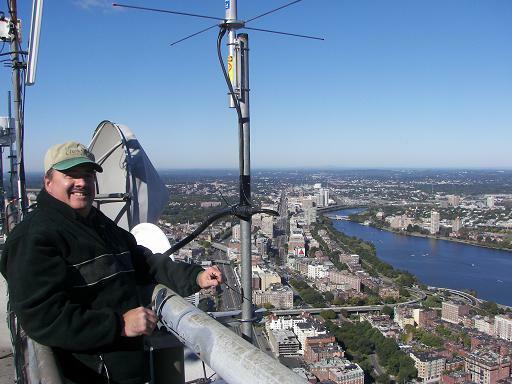 The club decided to relocate the 146.82 analog repeater to the Prudential and place the D-Star system in Brookline. The system went live in Brookline on June 27th, 2013.